After the successful flight of your first airplane, you have graduated into the next phase of control line flying I call Sport. Here, your choices of airplanes improve and the airplanes you fly will get faster and more maneuverable. I had a lot of fun with the next batch of airplane kits that were available, ones like the Combat Kittens by Top Flight, or Stuntman 23 by Carl Goldberg. Each of these played a role in the development of my building and flying skills. The Stuntman 23 was a simple, flat wing, all balsa airplane that used a Cox .049 motor. It was easy to build and painted up quickly. This airplane was a good flier and was light enough to do the regular stunts like loops and wing-overs. What's important in this phase of modeling is the increased level of building skills required to make the airplanes straight and warp free. This design had a tendency to develop some warped wings because they were a little thinner than the wing found on other designs. The airplane that follows some of the same construction features is my White Lightning. The White Lightning is a more advanced airplane in that it incorporates longer moments and a larger wing. It is powered by a slightly larger motor and is capable of all the stunts that are common in competition. This plane still retains construction techniques found in the simpler designs but has some refinements that make it perform at the upper end of this class of airplanes. 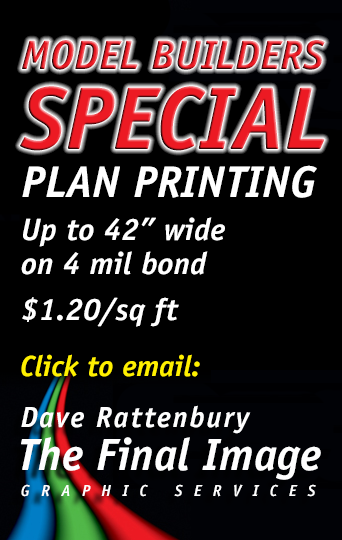 You can find more details on this design in the White Lightning area of the site. Even though my Sig Skyray 35 is a officially a Stunt airplane, it really fits here in the sport section because many people fly them as Sport airplanes. I modified mine, by increasing the size of the tail, to fly the stunt pattern more reliably and that moved it into the Stunt class. However, the Sig Skyray 35 is a fine Stunt trainer and all around airplane. I use it for the sport events as much as anything else. 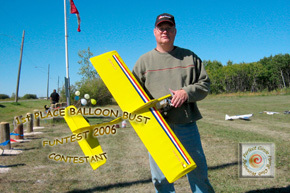 Here is a picture that I received after coming first in a balloon bust contest in September 2006. I had a great time flying with many others in the sport contest at the local control line airplane field. In this section I will review a few more sport control line airplanes that I believe you could enjoy as much as I have.